North Koreans are "devastated" following currency reforms that could wipe out their savings, reports say. Ordinary people are reported to be desperately trying to buy as many goods as they can with the old currency while it is still valid. The government told its people on Monday that it was knocking two noughts off the nominal value of banknotes. Experts say this will help tackle inflation and increase officials' control over an already impoverished population. They say the Pyongyang government particularly wants to rein in the activities of free markets that have sprung up across North Korea. 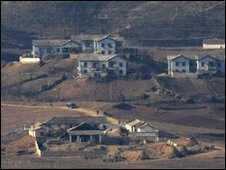 The North Korean government was initially quiet about the reform - telling its own people, but not the rest of the world. But on Friday South Korea's Yonhap news agency said a Japan-based newspaper with links to the North had confirmed the news. Yonhap quoted an interview the newspaper had conducted with a North Korean central bank official. The North Korean banker said international sanctions, natural disasters and the fall of the communist bloc had created economic hardship. This has forced the North to adjust its currency, Yonhap quoted the official as saying. Under the new system, an old 1,000 North Korean won note will now be worth just 10 won. North Koreans are thought to have until Sunday to change their old notes into the new currency. But there appears to be a limit on how much can be exchanged - one report says each adult can cash in only 100,000 won. At the time of the announcement one US dollar was worth 135 North Korea won at official exchange rates. That means each adult can exchange about US$740-worth (£445) of won. Many residents are reported to have reacted with anger and panic because any cash held above that figure will be worthless - effectively wiping out people's savings. Park Sang-hak, a North Korean defector now living in the South, said: "My contacts [in North Korea] called me to say North Korean people are in despair, crying and shouting - just like a war." 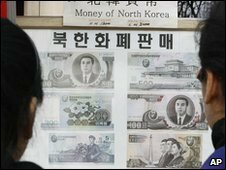 Some reports say the North Korean authorities raised the amount of money that can be exchanged following the complaints. Another defector, Kim Woon-ho, said people were "devastated" when they heard the news, which apparently came as a surprise. "Complaints are mounting because the North Korean government is taking money away from its people," said Mr Kim, who only left the North for the South this year. Are North Korea's leaders trying to destroy an emerging middle class? He said ordinary people were trying to buy as many things as possible with the old money before it becomes worthless - leading to massive price rises. But the picture emerging from the secretive communist state remains unclear. Another North Korean now living in the South said the new won notes were already being used because few people will accept the old ones. Many experts believe the reform is intended to curb rising inflation in North Korea. By limiting the amount of money ordinary people can exchange, the government is in effect cutting the number of banknotes in circulation. But some experts say the move is also about the government strengthening its control over its citizens. 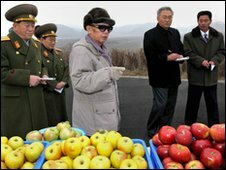 North Korea introduced limited market reforms in 2002 that allowed people to buy and sell goods at free markets. These markets have become increasingly important to ordinary North Koreans, with a wide range of goods on offer. State-run shops sell fewer and fewer items, but at free markets North Koreans can buy imported fruit, clothes and electronics, according to someone who recently visited a major market in Pyongyang. The authorities have recently tried to restrict what goes on at these markets. Writing in the Korean Herald, based in the South, North Korean expert Rudiger Frank said the currency reform was a political move as much as an economic one. He said officials want to destroy the newly-emerging middle class, many of whom have made money trading in the free markets. "The currency reforms are part of [a] campaign to return to the North Korean version of orthodox socialism," wrote Mr Frank, who is based in Vienna. "[The aim is] to eradicate the dangerous effects of the few years of reform."